King Kong Fury, created by NetGen Gaming, is a fun-filled game that is based on the popular 2017 King Kong movie of Skull Island. Essentially, this features themes of King Kong, in fights against the mighty dinosaurs in unchartered Skull Island, for survival. The most interesting aspect of the game lies in the graphics. Owing to the fact that game is derived and inspired from a hit movie, the audio visuals needed to be absolutely perfect. And that is exactly what this game promises. But, what are the features offered by this game? What are the possible win chances? What do you put at stake? This is what we will explore here, going through a range of points to note in the game. This comprises the various symbols involved in the game, the bonus cards, the possible outcomes, and the different advantages and issues of the King Kong Fury game. 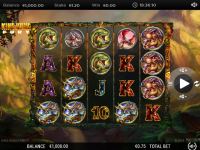 This online casino proves to be quite effective for the users. It is created on a very comfortable interface with different view sizes and formats, based on your requirements. All you would have to do is log in to the site with the username and password and you are set to go. From placing your bets to tracking them, you can do all of it from the comfort of your home. In fact, joining the game gives you a welcome bonus. In addition, the game has been made keeping compatibility in mind. This means, you could play the game on your mobile phone, on the move, just as well as you could play it on your desktop at home. Let us learn a little more about it. Owing to the fact the King Kong Fury is based on the Skull Island movie of 2017, one would expect to see a lot of different animals. This set of wild animals includes the T-Rex which is one of the most vicious dinosaurs. The T-Rex symbol essentially leads the pack while the others in this team include the Snake, the Pterodactyl, the Triceratops, the Insect and the others. However, the most important of them all is the King Kong symbol that tends to act as a substitute for all the other symbols. In fact, for the bigger and more exciting games, a total of 15 beasts and 12 wild symbols are incorporated in the reels. The T-Rex symbol proves to be quite an interesting and useful possession. It offers the best pay out from the list. If you have five of these T-Rex symbols at the maximum bet, you would be paid 10 times your original stake. There is another bonus symbol that is responsible for leading up to more free spins in the game. This symbol goes by the name of Anne Darrow. Hence, the T-Rex, King Kong, and the Anne Darrow prove to be the most important symbols here. Now, we come to the pay out provided by the game. Ironically, the most important symbol in the game, the King Kong symbol offers no pay out. If you are in for a big enough pay out, the ideal option would be to go after T-Rex. For a five of a kind, the T-Rex has the capacity to get you a whopping number of 250 coins! In addition, taking it a step forward, if you are able to fill up all the different cells, you would be rewarded with 12,500 coins! In general, King Kong Fury offers a lot of opportunities and potential for a win. In fact, King Kong Fury has an RTP or Return to Player is 96.703% which is quite the number! Considering a single spin, this interesting game has the potential to give you back 500 times the initial and original stake. There is another interesting aspect to it. The total win percentage is the same in the main game as it is in the bonus games. This keeps the players glued to the game throughout its course. The key lies in playing around with the symbols. If you can get 15 of the same symbol type, and collectively can lead to very successful wins in the game. Talking about the bonus features, there are essentially two bonus rounds for this game. The most famous and popular of this list is the King of Skull Island Free Games bonus that gives the player the chance to make an unlimited number of spins, up to 100. In addition to that, this consists of some stored wild cards that can allow re-spins. How does this magical number of 100 spins come up? Let us find out. Initially, the bonus card of King of Skill Island Free Games allows you only a certain number of spins. This number of spins is determined by the statue reels. As a player, you would be expected to spin the reel. This could land you anything between 3 to 10 spins. This is where the magic features in. If you get 3 spins in the statue reel, you would be getting a total of 3×3 spins, ensuring a total of 9 spins. Similarly, a count of 5 spins on the reel would assure you 5×5= 25 spins. Likewise, if you are lucky enough to get 10 on the statue reel, you would be awarded a total of 100 spins. This is the most interesting bonus feature of the King Kong Fury game. Another important bonus is the Anne Darrow bonus. This also rewards the player with a set of free spins. Whenever the spin ends up on reels 1 and 5, you are offered free spins to choose from. The fact that King Kong Fury includes the benefits of all these bonus features, makes it a more interesting, entertaining and rewarding game to play. Play King Kong Fury Now! Based on the movie from 2017, this game indeed is not difficult to play. It comes packed with simple rules and easy ideas. Any user would be playing this game with a total of five feels and 50 paylines, in addition with three rows. The basic structure of the game is such that it pays from left to right, beginning from the leftmost reel. The initial base game comes with two features. Once you spin the reel, you would be led into the interior features of the game. For instance, if you get yourself a Lightning reel during one of the spins, it will present you with one of the important symbols. This usually is chosen from the set of the essential dinosaur symbols. In fact, thereafter, 15 new dinosaur symbols, identical in nature, are added to the reel. This ensures you bigger and more productive wins. Each of the dinosaur symbols come with a different pay out. The maximum pay out is offered by the most ferocious T-Rex. In another situation where the spin lands you in the world of the Kong’s Call, a total of 12 wild cards could be added the reels, specifically numbered 2, 3 and 4. The bonuses come in over and above these processes to open up opportunities for more spins. King Kong Fury has proven to be quite the fascination in the gaming world. NextGen Gaming has actually taken gaming a step further with the inclusion of the rather interesting graphics and visuals. The fact that this game can be played equally well on both the laptop and mobile versions makes it a more accessible and user-friendly game. The power-packed features offered by King Kong Fury prove to be the most exciting and interesting feature. There are a lot of options at your disposal to choose from, in order to experiment with the different features. Additionally, King Kong Fury offers a very high potential for making wins out of games. This is evident in its high win rate. The RTP of 96.7% speaks volumes about the ability of the potential of the game. Based on the movie, the game features a theme where King Kong is seen fighting against some of the dominating dinosaurs to strive for survival. All thanks to the popularity of the movie, the game already has a set of interested potential players. The popularity if the theme makes this an interesting game. However, the fact that this game allows only one player to play it at a point of time reduces its scope amidst the enthusiasts. In general, the pros of this game have strongly outweighed the cons. The amazing visuals, the stunning soundtrack and background scores, and the range of features will keep you busy and entertained for quite some time. The facility of adding free spins to the game with the help of the bonus cards makes it an even more interesting option for gaming enthusiasts.